Interested in who is applying for CPA money? There will be two opportunities for you to see who is applying for what and how much. Public meetings on Wednesday January 7th in the Aldermanic Chambers of City Hall and on Monday January 12th in the third floor Community Room of the VNA (259 Lowell Street) have been set to give applicants a venue to present their projects to be considered for funding by CPA money...a total of $2.5 million. The Board of Aldermen, ultimately, gets to decide where the money is awarded. As I have said before, an aspect of the application process that I found particularly uncomfortable concerns the relationship of CPA Committee members and the Board of Aldermen to the applicant. As it stands right now, the State of Massachusetts Ethics Laws apply to this situation disallowing any member of either party (CPA Commission or Board of Aldermen) from financially benefiting from the requested project. 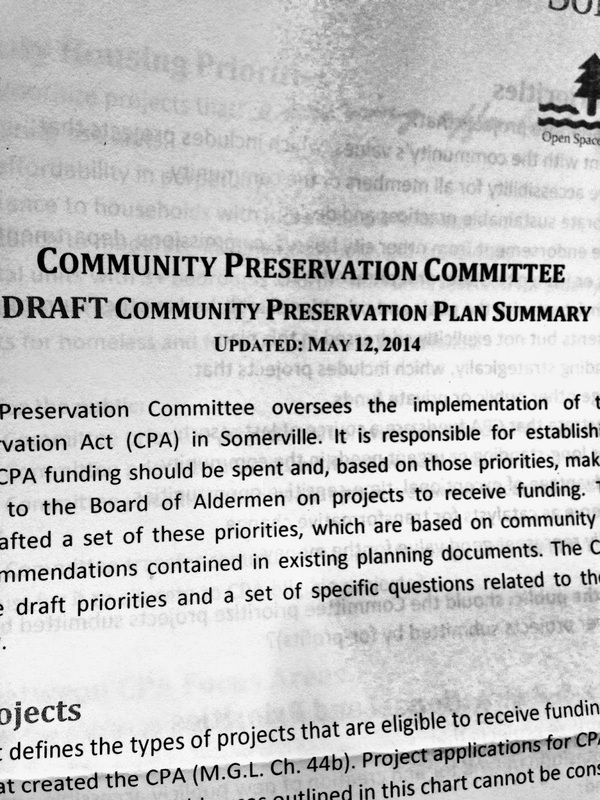 It is difficult for me to ignore that in, although a round-about way, there could be some financial benefit if certain Somerville organizations are approved for their projects. I did request that the Committee please take historical/current affiliation, as well as, political contributions made by applicants into consideration before approving. I plan on pursuing these concerns further as I would like to see a level-playing field for the issuance of CPA funds.